Creating access to resources that enrich and engage is part of Cara’s mission. Below you can find links to furthering your studies with Cara as well as finding resource recommendations that have inspired her and she hopes will do the same for you. What us Pilates Anytime? Pilates Anytime is an online Pilates studio, delivering world-class instruction anywhere, anytime, and at an affordable price. Many people are unable to attend Pilates classes due to the lack of easy access to studios, schedule conflicts, and cost. Pilates Anytime was born out of their desire to offer the highest quality Pilates classes to everyone. Unlimited access to all classes costs $18 per month, about the price of one Pilates studio class. 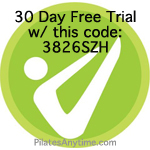 New subscribers have a free 30 day trial period during which they can fully evaluate the site and the classes. You’ve heard of TED Talks? Recently, while in Los Angeles with Pilates on Tour® and Balanced Body®, Cara was asked to give a “Joe Talk” and our good friends at Pilates Anytime® were there to film it. Her message IS ours and we want to share it with you! Here’s to Movement! And to You! What is the Legacy Project? The Pilates Legacy Project aims to be the most extensive online Pilates resource library, accessible to anyone, anywhere, anytime. And, because Pilates Anytime really wants everyone to look into the history of Pilates they are including it in the basic subscription for no additional cost. Whether you are an enthusiast or a teacher of Pilates, Pilates Anytime and Cara believes everyone should become intimately aware of Pilates history. For the enthusiast, it is a quicker route to understanding why exercises were created and offers many examples of how a consistent practice not only transforms your body, but also your life. Without an understanding of our history, without an appreciation of the lineage we come from, we devalue the discipline of Pilates. We owe it to ourselves to know where we fit on the ancestral tree of Pilates. It is a young history. It is our history. We are the future. Welcome to the Pilates Legacy Project! Taking Root to Fly- Irene Dowd, 1995. Phantoms In The Brain- V.S. Ramachandran, MD.PH.D. and Sandra Blakeslee, 1999.